The city of Seville and its surrounding areas hold a great variety of traditional popular festivals during the year, both religious and cultural, that add colour and spectacle to daily life. Many of them, like the April Fair and Holy Week, are well known all over the world, and are visited by millions of people every year. Holy Week, or “Semana Santa”, is one of Spain's most important religious events, and the celebrations in Seville are the biggest and most elaborate. Semana Santa is the week leading up to the Easter weekend, beginning on Palm Sunday. It's organised by over fifty religious brotherhoods, and features about seven processions a day, most comprising two large ornate “pasos” (floats carrying sculptures), which are carried around the streets by teams of men hidden beneath them. Hundreds of “nazarenos” follow the carved representations of the events of the Passion, and the images of the Virgin Mary showing her grief for the torture and killing of her Son. The sound of the drum, brass and trumpet bands that accompany the processions, and the smell of incense spreading over the city combine to create a unique atmosphere. Sometimes a special religious song, called a “saeta”, is performed, most often as a solo from a balcony overlooking the route, and evokes strong emotions. The best way to enjoy the processions is to find a place in the crowds and wait for the floats to go by. After leaving their home churches and making their way to the city centre, the pasos follows the official route from the north end of C/Sierpes via Avenida de la Constitución to the Cathedral. Although bullfighting might be considered as a negative aspect of Spanish culture, it is an important part of Spain`s heritage and for some visitors is definitely an item on their “must do” list, along with eating tapas, drinking sangria and watching flamenco. In fact, the Plaza de Toros de la Maestranza in Seville is one of the best places to see a traditional bullfight, as it's the oldest operating bullring in Spain. Located on Paseo de Colon, across from the river, this magnificent bullring represents the perfect place to experience the unique and electric atmosphere of a Spanish “corrida de toros” (bullfight). The bullfighting season starts on Easter Sunday, and lasts until after the "Feria de Abril". During this period there are bullfights every day of the week.There are also bullfights every Sunday in May that feature young bulls and novice matadors. Another important event is the Feria de San Miguel in September, when there are several more days of bullfighting. Between June and September there are only a few bullfights, about one every second week-end. Two weeks after Easter, as the temperatures rise and the orange trees begin to flower, the city of Seville gets ready for one of its most famous and fascinating fiestas, the April Fair. Started as a cattle fair in 1847, it has since become a popular international event, where people come together to have fun and share experiences until the small hours. These days more than a thousand “casetas” (temporary bars) line the streets of the fairground. Most of them private with limited access for visitors and tourists, but don´t worry, there are also a number of public “casetas”, where you can enjoy the music and food, while watching the fairgoers, many in traditional costume, dancing the popular Flamenco dance known as “Sevillanas”. On this occasion, you should definitely try rebujito, the typical drink of the April Fair, which is a mix of Manzanilla sherry and Seven Up. There is a great atmosphere, both inside the “casetas” and outside in the fairground streets. And after a whole week of celebrating Spanish traditions, you can watch a spectacular fireworks display at midnight on Sunday. • Starts on Monday with the Fish Dinner (or “La cena del pescaito”) and the switching-on of the fairground's thousands of multi-coloured lights at midnight. • Ends on Sunday with a fireworks display. • There are bullfights every afternoon at the Plaza de Toros de la Maestranza. There are several popular starting points for the pilgrimage, one of which is the Salvador Church of Seville. Don't miss this unusual and colourful event if you are in Seville at Whitsun. The pilgrims usually arrive in the village of El Rocío on horseback, by carriage or on foot, dressed in flamenco clothing. On Saturday there is a parade, where the pilgrims present their simpecado before the statue of the Virgin Mary, while the church bells ring. On Sunday there are various religious acts, the most important one being “jumping the fence”, when the people of Almonte jump into the enclosure to bring the statue of the Virgin out of the shrine and parade it around the village. During the night, in an atmosphere similar to Seville’s Feria de Abril, the local people and the pilgrims come together in their “casetas” with live music, dancing, food and drink into the early hours. The Feast of Corpus Christi celebrates the Eucharist, also called Holy Communion, and is held on the Thursday after the Sunday celebration of the Holy Trinity. In Seville the celebration usually begins with a mass at the Cathedral, where three dances, the “Seises” (Dance of the Six), are performed by children, the first addressed to the Blessed Sacrament, the second to the Archbishop and the third to the Municipal Corporation. At the end the mayor hands them the traditional gold doubloon as a gift. This is followed by the procession whose route was first established in 1532, passing through two archways erected for the occasion in Plaza San Francisco The streets, houses and windows along the way are decorated with various altars, shawls and a carpet of rosemary, which together with the incense of the procession spread its fragrance through the city. 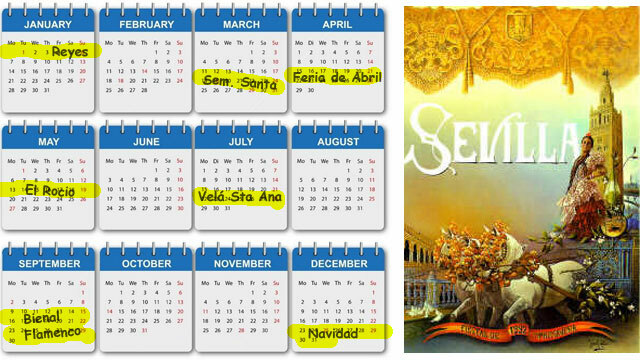 Every year at the end of July, the Triana neighbourhood of Seville celebrates the famous festival of Velá de Santa Ana in honour of Santa Ana (Saint Anne), who is the patron saint of Triana. For this occasion temporary bars known as casetas are set up along Calle Betis, beside the river. There you can have a drink and a tapa, perhaps one of the festival's specialities of green almonds, roasted sardines or fried fish, while watching people dancing a sevillana or enjoying performances by local singers, musicians and dancers. There are also lots of competitions, the most popular of which is the Cucaña. In this competition people try to walk along a greased pole projecting horizontally from the prow of a barge on the River Guadalquivir, to reach the prize (usually a red flag). The festival culminates on the night of the 26th with a great firework display. Held every second year in September, the Bienal de Flamenco in Seville is one of the most important Flamenco festivals in the world, and its excellent reputation attracts leading performers in the fields of Flamenco dancing, guitar playing and singing. There are professional performances in Seville´s main theatres and auditoriums, and even in the Alcazar Palace, and also a wide variety of other activities and events, such as Flamenco workshops, courses, conferences, meetings and seminars. Find more detailed information about this event on the official website of La Bienal de Flamenco. The Christmas holiday season officially begins on the 8th of December, which is the Day of the Immaculate Conception. Traditionally, bands of students dressed in mediaeval costume, known as “tunas” take to the streets surrounding the cathedral, playing guitar and singing. At the end of the evening they make their way to “La Purísima” in the Plaza del Triunfo to leave flowers and serenade the statue representing the Virgin Mary. The next day, there is a service in the Cathedral with children performing the traditional liturgical dance of the “Seises”. This is also when the Christmas lights in the city centre are switched on, and an air of festive gaiety comes to the streets. Belenes (nativity scenes) are set up in many places, notably in Plaza San Francisco. The Feria del Belen, or Nativity Fair is a market next to the Cathedral selling handmade wooden nativity scenes and pieces. Nearby, around the Hotel Alfonso XIII and the Puerta de Jerez, there is a small Christmas market offering food and products from other cultures. The more traditional Christmas market with a big illuminated Christmas tree is under the Metrosol Parasols in Plaza de la Encarnación, and there is another small market in the Alameda de Hercules. Although you won't see a white Christmas in Seville, the city still has a warm Christmas spirit. The Three Kings’ Parade takes place on the 5th of January (the day before Three Kings' Day) and includes over thirty floats making up a colourful procession. The streets fill with people awaiting the passing of the Kings and their pages in colourful Carnival costume, the children getting increasingly excited as the procession approaches. As it passes the Kings' helpers throw them hundreds of sweets, and the streets along the way are often sticky underfoot for several days afterwards. The parade sets out from the University of Seville on Palos de la Frontera street get to the Glorieta de San Diego and continues along Avenida del Cid and Plaza Don Juan de Austria. From there it follows the inner ring road along Menendez y Pelayo Street, Recaredo, María Auxiliadora, Ronda de Capuchinos and Resolana, then into the centre down Trajano and through la Plaza del Duque, Campana y O'Donnell. From there the parade heads towards the districts of Triana and Los Remedios to Plaza de Cuba and then returns to Palos de la Frontera where it began.